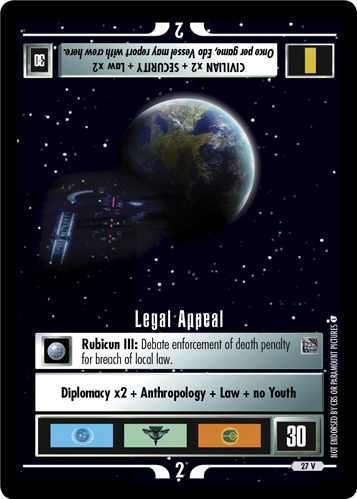 Rubicon III: Debate enforcement of death penalty for breach of local law. Mission located in Alpha-Quadrant with span: 2 and points: 30. Special instructions: Once per game, Edo Vessel may report with crew here. Card logging info: First edited by Telak at Oct 29th, 2014. Please support openCards and validate game text of this card!